What happens when you meet new friends who also love to travel? You’ll have more adventures and more places to go to. It was my third time to go to Dumaguete City but it was my first time to go to Apo Island. I heard that it was one of the best places in the Philippines to go scuba diving or snorkeling. My friends and I were talking about how beautiful the place was and the next thing we knew, our travel dates were set and tickets booked. Apo Island is a volcanic island covering 12 hectares in land area, 7 kilometers off the southeastern tip of Negros Island and 30 kilometers south of the Negros Oriental capital of Dumaguete in the Philippines. The name “Apo” was derived from a Filipino word for “grandchild”. The marine habitat around the island is a marine reserve, protected by the National Integrated Protected Area Act (NIPA) and under the jurisdiction of the Protected Area Management Board (PAMB). It has become a popular dive site and snorkeling destination with tourists. There are two resorts on Apo Island, each with a dive center: Apo Island Beach Resort and Liberty’s Lodge. There is also a ranger station and a lighthouse. Our plan was to take a bus ride from Cebu City to Santander Port and then hop on a ferry to Dumaguete. But since we couldn’t make it to the last trip at 3 p.m., we chose to take a ferry ride from Cebu City directly to Dumaguete City Port instead. It was an 8-hour trip (from 7 p.m. to 3 a.m.) and we just slept and saved our energy for the next day. Please check: Cokaliong Shipping Lines – Cebu-Dumaguete-Cebu section for the schedules and rates. 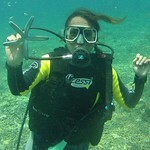 Days before the trip, I contacted the Harolds Dive Center in Dumaguete and booked a snorkeling package for five. We were told that we should be in the dive shop by 6:30 a.m. Please click here for the rates. For P 1,000 per person, it is already inclusive of the round trip land transfers from Dumaguete City to Dauin, a boat from Dauin to Apo Island and back, fees, snorkeling gear, guide, light breakfast and lunch. It was worth it; however, I would suggest bringing extra food since diving/snorkeling can make you hungry and the food included in the package isn’t much. For questions/reservations, please contact the Harolds Dive Center at +63 977 620 8926. Since we arrived at the port earlier, we decided to have our breakfast first. If you’re wondering where to have breakfast, Jollibee, Mcdonald’s and Chowking are open 24/7 and they’re all in one block. You can just walk from the port or ride a pedicab. Dumaguete is a small city and almost everything is a walk away, that is, if you love to walk. Otherwise, there are a lot of pedicabs and it costs Php 8.00 per ride. After we had our breakfast, we spent the time for a photowalk to Harolds. Approaching Apo Island. It took about 45 minutes from Dauin to Apo. P.S. Don’t forget to drop by the Dumaguete Boardwalk at night for Tempura. Try Sans Rival’s desserts. There are affordable pension houses in the city if you decide to stay overnight or a few days. There are also other tourist destinations like the Lake Balinsasayaw, Manjuyod White Sandbar and the Red Rock Hot Spring. How would you compare–overall experience, cost/convenience–to a similar trip to Bohol (Panglao, Balicasag)? Also, Apo Island looks pretty rugged. Were you able to visit any of the resorts? Are there beaches or anything interesting to visit on land? Apo is a very small island compared to Bohol. We didn’t set foot on the island and I think there’s only one resort. There’s no electricity and they only use a generator at night.